It seems like it’s not just K-idols that are attractive – K-beauty products are well-known for having some of the most adorable packaging around, and we all sometimes fall prey to buying products for the packaging (oops). Here are 6 of the cutest K-beauty product packaging you can ever find (we have excluded special collaborations in this article). Be warned, I’m not responsible if you are tempted to buy all of them! You might have heard about how good & affordable Peripera’s lip tints are, but did you know that Peripera makes the cutest packaging for their products as well? 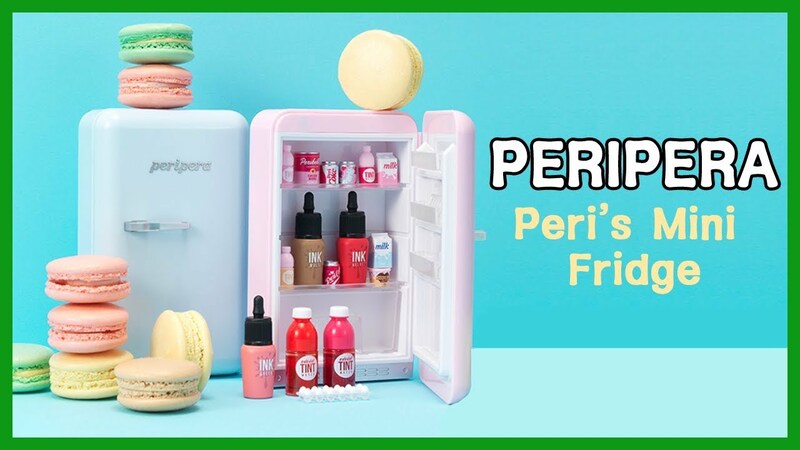 This mini fridge set contains miniature versions of Peripera products (that really work! ), which is also a great way for you to try out all of Peripera’s famous products before you commit to buying the full-sized products. MISSHA’s water gel lip tint promises high coverage and vivid colours, but when you’re not using it as a lip tint, you can definitely put this on your table as a beautiful crystal display (works even better if you buy more of them to form a pile). When you’ve finished the lip tint, you can even customize this into a cute accessory piece – talk about killing two birds with one stone! We all know Etude House has some of the prettiest packaging around, but this really takes the cake. As if a soft drink tint isn’t adorable enough, it even comes in a vending machine packaging? Just take my money already! Choco pie is a very famous snack in Korea that most tourists would definitely buy as a souvenir to bring home, but a chocopie hand cream is seriously ingenious. It makes you wonder if the person who thought of this design was eating a chocopie at that time. What I do know, however, is that looking at this makes me hungry already. THE SAEM is clearly winning this packaging game with this lip syrup that reminds you of, well, syrup. Apparently it is infused with the scents of different syrup flavours, so you really feel like you are applying chocolate sauce on your lips. Too cute! This is for all your alcoholics out there (yes, you, don’t deny it). These are formulated with French wine extracts, hence the wine packaging. You could probably buy lots of these to fill a shelf and pretend that you are a wine connoisseur who has a wine collection at home. Alternatively, you could simply whip this out in public and enjoy a few curious stares from people who think that you are applying wine as lipstick. The peripera mini fridge is cute! The ink velvets are my favourites out of the lot. It’s definately a great way to try out stuff from the brand and the fridge is adorable as a decorative piece. OK, so those lip syrups are beyond cute! But they look too much like Heinz tomato sauce, I’d be forever expecting a tomato flavour with the red one! The Chateau wine lip tint is a must on the bucket list of any K-pop fan, especially EXO-L (read: meee!! ).